I've now seen part of 2009, and all of 2010, 2011, and all of 2012 as a paraplegic. My paralysis has caused me to have three operations and spend almost one and a half years in hospital. Everything that has happened to me I later read to be quite rare conditions starting with my initial 'injury', a subdural hematoma in my spinal cord, very, very rare, probably caused by an arteriovenous malformation also rare. I then had an operation for an arachnoid cyst which formed at the initial lesion site, quite rare, and then followed up by syringomyelia which is like a fluid filled tube in the spinal cord which goes upwards, thus causing damage above my injury level. For me this meant a loss of sensation in my back and some pain in my upper right arm. Syringomyelia, also rare. I've had so many rare things that I sometimes joke to myself that I ought to start buying lottery tickets. You'd think that by this point in the game I'd start to lose hope in ever walking (and going to the toilet normally and making love - let's not forget these biggies) like before, but I haven't. And I tell you that my hope is not based on a simple want or an illusion, but on real scientific facts that someday we will return from paralysis. It's impossible to name ALL of the big research going on and because I know that many of you have an aversion to reading long scientific papers, I would like to introduce you to hope that you can watch. In my September and October blogs I introduced you to the Working2Walk conference held in California. This conference introduced some amazing new research into curing paralysis and not only was this information made available to the participants, but it’s also available to all of us on the Unite 2 Fight Paralysis vimeo site. I urge you all to spend some time watching these videos and learning about the real hope that exists for us. And as always, I urge you not to just sit and wait for cure to bite us in our collective rear ends, but to work towards it. 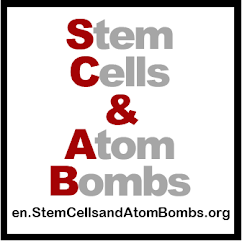 If you don't know what to do, a good place to start is with my blog’s CureCaptains or the Cure Warriors run by U2FP. 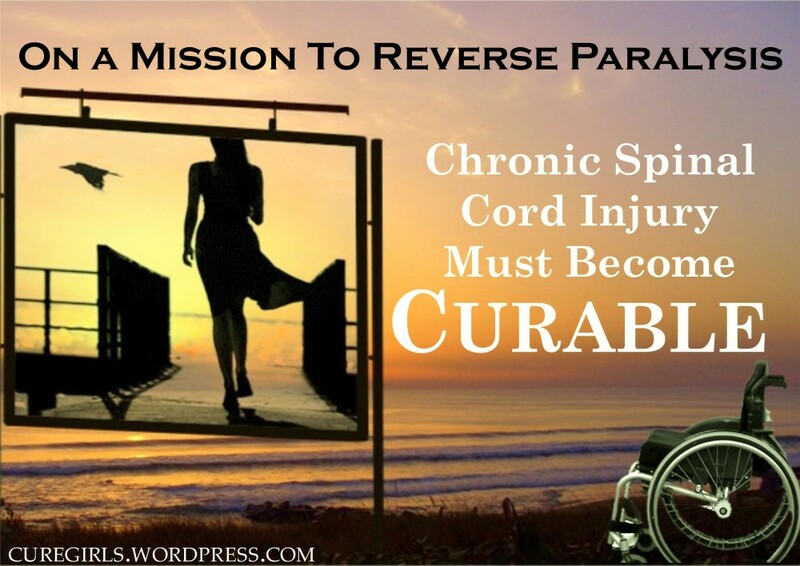 These programmes help you participate in a cure for paralysis. We also have some work ready to go for January 2013. First we will be meeting with a leadership team from the Rick Hansen Institute/Foundation (RHF/I) to talk about their vision for a cure for paralysis. Many of you supported our actions aimed at RHF/I in the past and it was your emails of support that finally got them to agree to meet with cure activists from across the world to hear our ideas on how they can further a cure for chronic spinal cord injury. Also, on 15 January, a colleague of mine from the UK and I will talk with the CEO of Christopher and Dana Reeve Foundation to talk about our concerns that they are spending too much time 'celebrating' paralysis, and not putting out enough information out on 'curing' paralysis. Both of these meetings have been set up because you all continue to stir hope and support our actions. I leave you with one final message for next year from a man who is my hero; Tommy Douglas who led the first socialist government in all of North America when he was the premier of Saskatchewan, and is the father of socialized medicine in Canada. 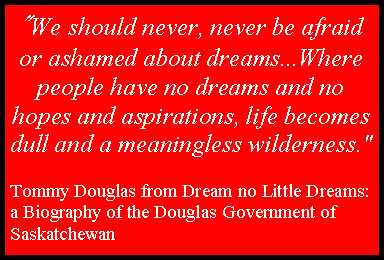 "We should never, never be afraid or ashamed about dreams...Where people have no dreams and no hopes and aspirations, life becomes dull and a meaningless wilderness."